On a recent Called to Coach, we spoke with Gallup-Certified Strengths Coach, Sindhu Aravindakshan. When Sindhu began working for Facebook, she was introduced to a strengths-based culture. Her colleagues and team members welcomed feedback and discussed their strengths openly. When she joined JDRA, a software company, Sindhu wanted to "...start a strengths revolution" as she described it. At JDRA, Sindhu is a Learning and Development Specialist. In that role, she strives to infuse strengths into each stage of an employee's career: hiring, onboarding and development. Sindhu began by changing the hiring module questions for potential candidates -- those questions now focus on strengths. Further, when new employees are onboarding, they take the Clifton StrengthsFinder assessment. According to Sindhu, those employees are then "...given a sneak peek at their strengths. Then, once they have settled into their role, they approach me for more detailed strengths coaching." Strengths are also used to help tenured employees thrive in their roles with their strengths. They are even used to manage change at JDRA. That is, during times of change or transition at the organization, Sindhu explained, "We name 'change champions' whose strengths are well suited to making change smoother and easier for everyone." Also, Sindhu frequently conducts strengths workshops for teams across JDRA. To hear more about strengths coaching at all levels of an organization, please watch the video or listen to the audio above. 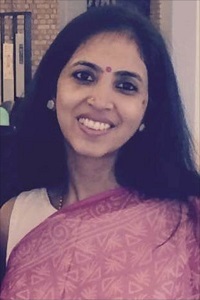 True to her name, which is derived from the name of a river, Sindhu has gathered rich experience through 15 years of work experience across organizations from various industries. At work, she typically pulls together deep knowledge and experience in psychometrics, neuroscience, learning and development, leadership styles and OD. As a coach, she hopes these will help her create a holistic view of human behavior, thereby maximizing the depth and value of my coaching conversations. Sindhu's Top 5 Strengths are: WOO, Positivity, Activator, Maximizer and Learner.